The history of Lowfield Heath is closely related to the history of transport in Britain. The village came into existence because it was on the main road from London to Brighton. Its significance faded as the railway system developed, but increased again with the coming of motor vehicles. Its ending followed the creation of Gatwick airport. 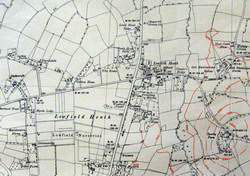 Until the eighteenth century Lowfield Heath, otherwise known as Lovel Heath, was an area of common land on the border of Surrey and Sussex. There were several farms around the periphery of the heath, but no larger settlement. In 1696 an Act of Parliament authorised the construction of a road from Reigate south to Crawley. At first the road was a causeway for pedestrians and horse riders, with posts to prevent access by wheeled vehicles. In 1755 it was widened and became a toll road, open to all forms of traffic. Rocque's map of Surrey in 1762 shows a few buildings close to the intersection between the road and a road running east to west between Tinsley Green and Charlwood, and a windmill a short distance to the south. 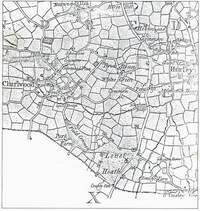 Then in 1770 the road from County Oak, at the southern edge of the heath, to Brighton was widened, with the result that the entire route from London to Brighton was now turnpiked. On the east side of the road, just north of the crossroads, the White Lion inn and a blacksmith's shop opened to serve the needs of travellers. Houses and other buildings were erected nearby. The gradual process of enclosure at the end of the eighteenth century and in the first half of the nineteenth century assisted the creation of private property and the right to construct buildings. The history of the Brighton road is intriguingly described and wonderfully illustrated in Charles Harper's book The Brighton Road, third edition published by Cecil Palmer in 1922. By 1821 over forty coaches a day ran between London and Brighton, and on Friday 25 October 1833 at least 480 people travelled to Brighton by stage coach. On the whole coach providers competed to complete the journey in the shortest time, but for a while there was a slow coach, the Life Preserver, whose schedule was intended to appeal to old ladies and the timid. Accidents were frequent, especially when coaches reached speeds of more than ten miles an hour or when the load of passengers and goods became excessive. During the 1830s there were occasional short-lived experiments with carriages drawn by steam engines. Charles Harper's book can be downloaded from the Internet Archive website. Make sure you request a version that will allow you to see Harper's superb illustrations. The railway to Brighton was completed on 21 September 1841. Within six months all public coach services came to an end, and the road through Lowfield Heath was much quieter. Private carriages and horse riders would have continued to use it, and it became popular with long distance walkers and cyclists. Among the walkers mentioned by Charles Harper Benjamin Trench set out at 6.00 pm on Friday, 20 March 1868 to walk from Kennington Church to Brighton and back, having wagered that he could cover the distance in 25 hours. Arriving back in London at 5.00 pm the next day he spent his spare two hours walking round the Oval. 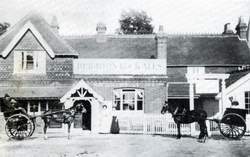 By 1900 the village of Lowfield Heath included a tea room as well as the White Lion, a shop and post office, some small manufacturing businesses, and a school. 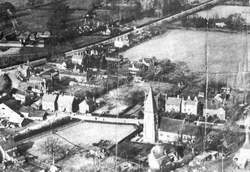 Houses were built along the north side of Church Road and at several other locations around the village. Rocque’s map of 1762, showing Lovel Heath just inside the Surrey border. 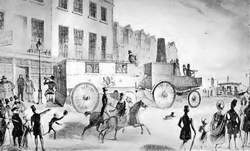 Sir Charles Dance’s carriage, drawn by a steam engine, leaving London for Brighton in 1833. This drawing comes from The Brighton Road by Charles Harper. 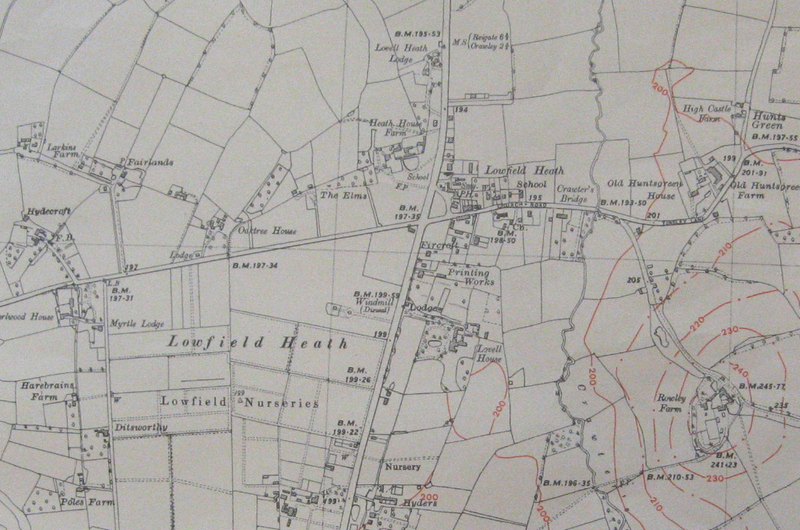 Lowfield Heath and the surrounding area in 1948. Lowfield Heath from the south east. The crossroads lies outside the picture on the left, but this photograph shows most of the village. I assume the photo was taken in the 1930s after the Surrey Aero Club was formed.